Congratulations to author WPBakery (formerly Mixey) who has reached Power Elite status by making one million dollars worth of sales. Visual Composer, their best-selling item with over 25,000 sales, plays a large part of the story of their success, which lead to the idea of creating a dedicated landing page to highlight the amazing story of this Plugin. We see many young guys who have… already found their niche in Visual Composer add-ons. We see how they are moving toward their goals and success, and we are very happy for them. Michael is building a team of strong individuals with unique skill sets. They’re able to look at problems from different points of view, and come up with fresh ideas that are discussed and reassembled. He also has a dedicated support team, and sees that as a key factor in the team’s success. We asked Michael a few questions about the journey to the $1,000,000 milestone. Read on to discover how he built a team with a culture of “no limits”, handcrafted a stronger brand identity, and how it feels to reach a million dollars worth of sales! Happy Power Elite Day WPBakery, and welcome to the club. How does it feel? First of all, I would like to start with thanking the whole Envato staff team. You guys have done an amazing job by building such a strong Marketplace and community, where young and talented individuals can reach their goals and make their dreams come true. As for me, it’s been a really breathtaking journey so far, and I perceive Power Elite status as proof that our hard work at WPBakery has gone in the right direction. Even though I knew it was coming, it still took my breath away, and put big, happy smile on our faces. Still, I believe that this is just the start, leading to something even bigger. How long has this journey taken you? It is always harder to take your first steps. Once you’ve done that, you can start to walk or even run. That’s what happened to me at Envato. My start was slow at the beginning (as is everyone’s) due to the fact that I was searching for the right place, where I could fully use my skills and expertise. 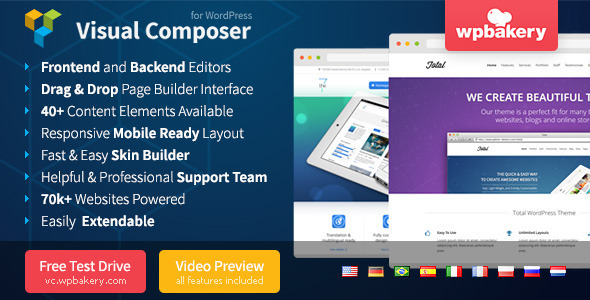 The biggest breakpoint, of course, was the development and success of Visual Composer, which started three years ago, and acted like a boost towards Power Elite. Since then, our success has grown exponentially, which allowed us to set new goals and break records on a daily basis. We are a small group of strong individuals with unique skill sets, which allows us to look at the same problems from different points of view. I think that this is one of the key factors which determines our success so far. Here at WPBakery, each team member can come up with fresh ideas, which can then be revised, discussed and reassembled into amazing solutions. At the moment we have three guys (including myself) in our headquarters, and more will join in the near future. Getting to individuals, I, Michael, am a multidisciplinary guy who loves to be in every stage of the process, and be aware of everything that happens in and around WPBakery. Recently, one of my main goals has become backing up my teammates, and ensuring that they understand that there are no limits they can not reach. Then we have Vyacheslav, who was the first one to join me, and for who I am very, very thankful. Vyacheslav is an amazingly talented developer who is able to implement all the crazy and difficult ideas we have here. In our work process, we don’t often think it’s impossible to implement something, as we are sure Vyacheslav will find a way, and fully rely on his competences and skills. The third team member at our office is Raitis, who is currently a product owner, and also a multidisciplinary guy with a great visions on where Visual Composer should go further. He is passionate about user interfaces, and has a strong knowledge of online marketing. Even though Raitis is the latest one to join our team, he has already proven to be a valuable asset and a great teammate to us here at WPBakery. In addition to our headquarters, we have a professional, dedicated support team, which is much-appreciated by our customers, and also one of the factors of our success story. It’s great to have a successful CodeCanyon author on the Elite program. What lead you to programming, and how old were you when you first started? I would not consider myself a programmer, but more like a Swiss army knife type of person who is attracted to how things look and work. I got into IT when I was 16 years old, working as a freelance designer, and had little knowledge of programming. Nevertheless, I knew that I wanted to dig deeper into development too, and after some time I discovered Macromedia Flash—a whole new world which combined both design and development. While having a lot of fun working with Flash for a couple of years, I always investigated current trends, and where the Web was going. During my research, I found a very promising platform called WordPress, which immediately grabbed my attention. At that time I was already a member of the Envato Marketplaces, and I decided to get my hands on a WordPress theme, which resulted in me digging deeper and deeper into the world of WordPress, which is where I am now. Explain to everyone how the names Mixey and WPBakery work together. The word Mixey (pronounced Mihey) is synonymous to my name Michael, so I used it as my virtual identity when I first decided to register my account on Envato. At that point I didn’t think about strong brand identity, and the idea behind it. Then at some point I understood that Mixey is just not strong enough for me to move my products in the market, and I started to think about what am I doing, and how I would love people to see me and my products. Either it was hunger, or the opposite—tasty cakes before bedtime—but in the morning, I woke up with the clear idea that WPBakery is the brand name that clearly states my ideas and items. Nevertheless, a lot of customers already recognized me as a Mixey, so I just couldn’t just throw it away, and decided to keep it for some time. Finally, the merge has happened, and we are proud to announce that from today we are recognized as WPBakery on Envato, which somehow determines the start of a new era, goals and opportunities. Visual composer has been a huge success, leading to this Landing Pageidea, which is awesome. Tell us a bit about how you came up with the idea. If we talk about Visual Composer as such, my experience was the same as many other developers. I struggled with using WordPress shortcodes, and saw the approach as not being user-friendly, especially when it comes to customers who don’t have technical skills. I had the idea of creating something that would lower the barrier to using WordPress in the everyday life of an average user, and just then Envato made a necessary push by putting a bounty on WordPress drag-and-drop editors. After releasing my first version, I received tons of messages of appreciation from customers worldwide, and Envato granted me a prize. Starting from then, I have worked hard to make Visual Composer better with each release, and as some early users may have noticed, it has become very different and more powerful from what it used to be at the beginning. After some point, my teammates and I understood that we can help customers (and ourselves) by allowing others to work hand-in-hand with us, by creating mind-blowing add-ons which expand the capabilities of Visual Composer beyond its limits, in ways we could not imagine. We started work on promoting the opportunity of add-on development, which gave almost immediate results. The next big thing was to show the world how great those add-ons are. Here we would like to thank Envato, as we were having a really close discussion on how to do it, while our collaborative work lead us to this amazing idea. What is the next big thing for WPBakery? I know that you have more Power Elite levels to reach for, so we have already scheduled when we are going to do this. Talking seriously, we have a huge number of ideas on how we should move WPBakery and Visual Composer towards a powerful WordPress platform—not just a plugin—as this is something that our customers and add-on development partners are waiting for. We also understand that we are at the point when our own efforts are just not enough, so one of our goals is to develop a community within a community—one that is able to grow rapidly on its own, with the focus on customer demand and worldwide trends. Any hot tips for the young guns out there? Where should they start? First of all, do not be afraid to make mistakes. Look around, and try different things and approaches to find the niche which suits best for you. Even if it looks small, it can still grow into something big, just like it happened to us. During our work with add-on developers, we see many young guys who have joined Envato and already found their niche in Visual Composer add-ons. We see how they are moving toward their goals and success, and we are very happy for them. You are a long standing member—you joined up in 2006. Wow! If you could tell that youngster something then, what would it be? I usually do not love to dig into past and think, ”What would have happened if …” The combination of mistakes and successes has made me the person I am now, and I am glad everything worked out that way. I have learned a lot, and I believe that a lot of different things are awaiting me in the future. We would like to thank all our customers. We are very excited to see that they have appreciated Visual Composer, and most of them have become loyal to us as we see tremendous trend for returning customers. Just like we did before, we are going to carefully listen to their wishes, and develop Visual Composer towards their desires. We are also thankful to all the developers who have already joined our family, and work hard to create stunning add-ons. Plus, we want to encourage new developers to join us and create their own success stories with Visual Composer through the development of add-ons.